Been road riding for the past 3 years...with no intention of ever stopping! 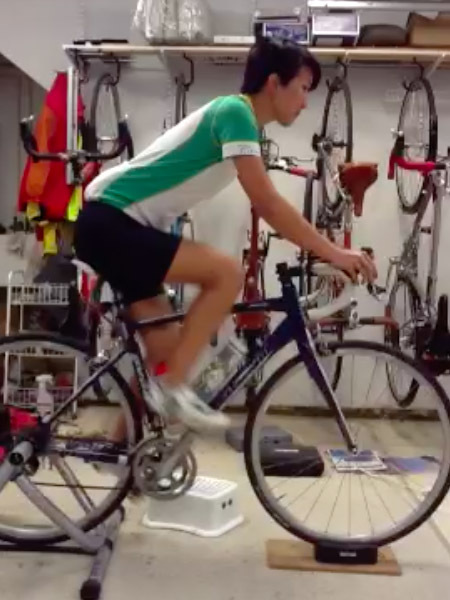 A great bike fit will have you riding with ease and comfort. I consider Debbie my "poster child" for what the fit process can do to improve your ride. When she came to me, I knew I had a strong and flexible athlete, but as soon as she got on her bike, I could tell she wasn't able to ride very fast or efficiently. Every bit of her position was wrong. In fact, she was so wrong that I didn't bother with a before video. I adjusted her cleats, her saddle position and height, her stem length and height and more. She was sitting low and too far back "for no reason". Debbie has great core strength and flexibility and a fitness level to be envied by most. Her bike frame was fine, but every other part needed an adjustment. Now, she rides with speed, ease and comfort. Check out her "after" shot to see what a perfect fit can look like. I bought my bike in April 2011 after I decided I wanted another mode of transportation and to try out road cycling. I discovered that I loved road cycling while occasionally using my bike for errands. Soon after, I decided to try my hand at Olympic distance triathlons and began to participate in local rides with different groups and clubs. I began to notice that any ride over 25 miles produced pain in my right knee. One day after doing about 35 miles on the bike, the pain in my knee was so bad it was difficult to walk for the rest of the day. I knew I needed to get a proper fit, and I heard rave reviews about Smiley from friends. After my bike fit, I no longer experience pain in my right knee and have gained a whole host of other benefits as well. Since my weight is properly distributed on the bike, my bike handling has improved significantly. The change in weight distribution on the bike has also forced me to engage my core, and I no longer put as much weight on my arms and hands which was creating a lot of tension. I'm now a more efficient rider and ride much faster than I did before.